oscillations in many machines and installations, as well as in the development of products such as tools or components. Measurements of the vibration meter provide the following parameters: vibration acceleration, vibration velocity and vibration displacement. In this way the vibration is recorded with great precision. 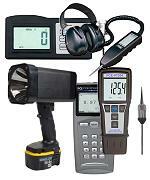 The vibration meter is a portable device and its readings can be stored and retrieved for later use.